in Kolkata on the morning of 10 October, 2005, the first day of the traditional four-day Durga Puja festival held annually by Hindus in Bengal. Transcribed by Sripad B.P. Siddhanti Maharaj and checked by Sripad B.P. Janardan Maharaj and Sripad B.P. 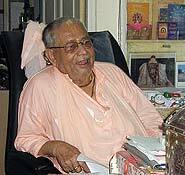 Tirtha Maharaj, all currently staying with His Divine Grace at our Dum Dum Park Temple, Kolkata. It will rain again today. [It has been raining briefly but quite hard almost every day for a week -Ed.] They are taking so much from material nature and now that reaction is coming. This type of illusory environment also happened a long time ago in the time of Sri Chaitanya Mahaprabhu. People are taking so much material benefit that the earth cannot tolerate it, so there must be some reaction in the form of disturbances from the environment. In America there have been so many disturbances by prakriti [such as the hurricanes and floods in New Orleans] and now there has been a big disturbance in India and Pakistan by an earthquake. What can people do when an earthquake comes? But still I hear our devotees are not disturbed by the disturbances: earthquake, tsunami, etc. Actually what is happening in the external world is causing the world to go to a hellish position. Here in Bengal they are giving so much energy for Durga Puja but Mother Durga is the negative power of Lord Krishna. The positive power is Radharani, and the negative power is Durga. Today they are especially worshipping Durga, but all the activities of the external world are moha grasta, captured by illusion. namastasay namastasay namastasay namo namah. Whose name is Vishnu Maya has taken form as Durga... and we are paying our obeisances to that Durga." They are saying Durga is Vishnu Maya and that everything is going to Vishnu but they are not worshipping Vishnu. This is the illusion. They are saying "Vishnu Maya," that Durga is the power of Vishnu, so Vishnu is the Supreme Personality - as Krishna's form - and He is the Godhead. They know it through this mantra, and every day they are using that mantra - but they are not worshiping Him. Everywhere this world is covered by maya but inside of that there is consciousness, chetan. Everywhere is conscious form, everywhere. Through this sloka we can understand consciousness is everywhere and when consciousness is pure, consciousness is in its proper position and has a connection with the transcendental world. Otherwise all is material thinking and we are dancing over that material, but inside there is consciousness. Our consciousness is covered by Maya so our consciousness hasn't bloomed. Although everything is covered by illusion we are trying to get the association of the transcendental divine form of the Lord, and that is Hari Nam. We are always chanting Hari Nam and through that we want to get some association of the Lord. When the Lord will appear in our heart, He will dance on our tongue and the illusory environment will leave us. An example is when we light a match in a dark room which has been dark for a long time, even hundreds of years, the darkness will immediately go out. This is the power of consciousness. We want to get the association of that consciousness by our practising life, and when that consciousness will be connected with the transcendental realm without offense - so we should chant purely - everything we'll find. Ye-dina grhe bhajana dekhi, grhete Goloka bhaya. [6th verse of 'Suddha-bhakata...' by Srila Bhaktivinoda Thakur.] "When we will maintain the devotional practising life in our house, or anywhere, there will appear the environment of Goloka Vrindavan." It is necessary to get that.